I met Barbara Godard once. She was the plenary speaker at the McGill English Graduate Students’ Conference when I was in the first year of my Master’s. I remember being awed first by the vertigo-inducing complexity of her plenary paper, and then, later, when I was able to talk with her at the evening reception. In the years that followed I remember seeing Professor Godard everywhere: at the Congress of the Humanities and Social Sciences sitting in the audience to see a particular paper at ALCQ-ACQL, then slipping out to make time to attend a presentation at ACCUTE, CACLALS, or any number of associations. More recently I remember her dancing at the last TransCanada conference. But perhaps most of all, I remember coming across one of her articles while I was studying for my PhD candidacy examinations. The article, not included in the collection under review here, was “Feminist Periodicals and the Production of Cultural Value: The Canadian Context.” In it Godard attended to questions about “the constitution of cultural value” by reading feminist periodical production as “participat[ing] in an economy of the gift rather than one of accumulation.” “Feminist labour,” she cautioned, “risks foundering in a more strongly entrenched private sphere than participating in the collective as citizens” (213). Two aspects of this quintessentially well-wrought essay struck me immediately: its encyclopedic range and its place of publication, the Women’s Studies International Forum. I learned more about the history and culture of feminist periodical publishing in Canada in those pages than I had in my graduate career up until that point. And I was alerted to an international organization publishing work on Canadian women’s writing. This multi-faceted learning experience is, for me, what it means to read Godard’s writing. And so, like Danielle Fuller, I too feel I am a student of Godard’s, though I was never in any of the classes she taught (“Reader at Work: An Appreciation of Barbara Godard”). I too submit this review as a work in progress, whose subject, “even as I speak…slips away from slips away from me” (“Structuralism/Post-Structuralism” 53). For Godard is always one step ahead in her writing, as she was in her life, blazing trails for scholars and critics alike. Canadian Literature at the Crossroads of Language and Culture was published in 2008. The essays it collects function as a chronology of Canadian cultural criticism while, simultaneously, developing lasting, even timeless, problems and arguments relevant far beyond the Canadian context. The volume collects nine of Godard’s more than two hundred published essays. As editor, Smaro Kamboureli states in her notes that this is merely a selection, “so, though this volume is long, it includes only a small selection of her writings” (13). The editor’s choice of essays offers an attempt to reflect the “ ‘wide net’ within which [Godard] always cast her writing” (13). Kamboureli’s editorial hand is not heavy. Indeed, save for a lengthy interview with Godard, which I’ll discuss presently, there is no editorial intervention to be seen. Neither original date of publication, nor editorial introduction accompany the essays. This is both admirable and, simultaneously, a bit unfortunate. For, while the essays certainly stand alone as a rigorous taxonomy of Canadian culture via Canadian writing, each essay is very much a product of a particular cultural moment. In the table of contents the essays parenthetically note their original date of publication. They haven’t been ordered chronologically, and thus this reader is left with the desire to know why they’ve been arranged as such. Further, a reader not intimately acquainted with Godard’s incredible and vast interests and connections might be left with the sense that she’s missing part of the conversation. But, as Godard notes in the first essay of the collection, the reader’s task might be similar to that of the critic’s who, like Scheherazade, “speak[s] under the threat of forced closure…[in] an endless tale, the saga of the ‘new new criticism’ of Canadian literature” (“Structuralism/Post-Structuralism” 53). The first section of the collection is a fascinating discussion between Kamboureli and Godard. I say discussion because while it is certainly structured like an interview, it has a discursive flow that is often absent in the question/answer structure of the interview. Kamboureli explains in her note that the interview was “designed to serve in lieu of the critical introduction” she might have written. She used the interview style to disrupt the habitual structure of critic/literary author and to allow readers the all too rare opportunity to hear the critic situate herself “in contexts that illuminate the conditions that have contributed both to the production of her own work and to the evolution of Canadian literature as a discipline” (14). Thus it is in Godard’s own narrative that the reader learns about her comparative education, her insistence on studying Canadian literature at a time well before its institutionalization (which, ironically, is again at risk as Godard repeatedly points out in essays that follow), and the influence of Malcolm Ross on her educational trajectory (after winning a Canada Council doctoral award to go to the University of Toronto, Ross said to her “Get out of here!” And she did, choosing instead to study at the Université de Montréal where she could take classes in both English and French). Godard studied in Bordeaux with Robert Escarpit, co-founder of the International Association of Comparative Literature, and she taught with Hélène Cixous at the Université de Paris VIII. She attended lectures by Roland Barthes and Jacques Lacan. Upon returning to Canada she was absolutely instrumental in bringing not just the study of Canadian literature into the university system, but also crucially, the interdisciplinary, comparative study of Canadian literature into the system. This was in the 1970s. Godard’s annual contract position became tenure-track in approximately 1978 (26). When asked how her comparative work and her “more intense focus on Canadian literature” enhance each other (Kamboureli 26), Godard turns to Gramsci who “notes, language—and culture, I would add—‘cannot be anything but comparative,’ always positioned in relation to another temporal moment or geopolitical space and so considered not in terms of identity but of relationality within vectors of power” (27). A failure to work comparatively, then, is a failure to attend to the cultural production of one’s own place in a transnational space. The dialogue ends on an important and sobering note. When asked about her views on the state of affairs—institutional, interdisciplinary studies of Canada—Godard cites an astounding decline in the teaching of Canadian literature (51). Her concern is in no way pat nationalism. “The decline in focus on Canada is troubling,” she explains, “since the nation continues to be a significant horizon within which to produce and study culture, when national arts and research councils accord financial support to culture within their geopolitical boundaries” (51). Though it remains unsaid, that this decline signals a kind of institutional foreclosure of the study of Canadian literature haunts not just the dialogue, but indeed the entire collection. Godard fought to make plain the importance of reading Canada’s cultural production rhizomatically and interdisciplinarily. It remains the reader’s task to take up her efforts. Godard’s writing is paradoxical in the most productive ways: it is stylistically dense while remaining eminently readable. The critic’s voice is always present, never lost or tangled among the extensive supporting research and critical frameworks of her essays. Rather than walk the reader through the entire collection, I’ve chosen instead to focus the remainder of this review on the opening four essays which, while substantially different in content, work together to establish the overarching concerns and tactics Godard uses throughout her critical work. No essay is an island unto itself. She is unrelenting in her comparative work: each essay stands in relation to the others, all work individually, and as a whole, to read Canadian cultural production within vectors of power, be they language, borders, race, gender, or genre. The opening essay of the collection, “Structuralism/Post-Structuralism: Language, Reality, and Canadian Literature” was first published in 1987, and yet in it Godard demonstrates her enviable ability to transcend her own moment of writing. The essay, which plots the evolution of theoretical criticism to its time (1987) is “organized under the sign of the future indicative” in order to demonstrate the “vitality of Canadian post-structuralist criticism which has long been invisible” (54). Using as her springboard a paper by Stan Fogel (“Why Michel Foucault does not like Canadian Literature” 1984), Godard pinpoints but one moment where Canadian critics fail to read the field of Canadian criticism. She observes that we should be unsurprised by the “divergence in the directions of contemporary American and Canadian criticism” because “New Criticism never held sway in Canada as it did in the United States” (54). Mapping the evolution from structuralism to post-structuralism atop the English/French critical divide, Godard illustrates a palimpsestic relationship that is the Canadian “new new criticism” (55). Marking her starting point as 1974, Godard contends that a sea change in Canadian criticism occurs in this year when the annual Learneds (now the Congress of the Humanities and Social Sciences) became “the occasion for the first examination of the states of literary theory in Canada and Québec” (56 my emphasis). Here, as in virtually all her essays, Godard is working on multiple levels. By drawing attention to the difference/divide/différance in English and Francophone criticism, Godard underscores both the potential polyvocality of the Canadian critic and the way in which the work being done in Québec has been marginalized. Godard argues that thematic criticism, which seemed to dominate the Canadian scene, has in fact a long history of dissent and differential responses. Citing Frank Davey, Eli Mandel, Pricilla Galloway, Georges Poulet, and Linda Hutcheon alongside the Geneva School, the Yale School, Heidegger, Lévi-Strauss, Gaston Bachelard, and, yes, Derrida, Godard traces a complex and oft-unrecognized genealogy of Canadian literary criticism. If the reader were to attempt to connect the essays in this collection, in search of some meta-argument or line of inquiry, the closing lines of the first essay may serve as a guide: “If a wide net has been cast,” Godard offers, “it is a web of holes held together with a string. This thread will soon be unraveled by other deconstructions of its presuppositions and by the appearance or yet new critical theories on the scene” (82). In addition to her compendious knowledge of the Canadian cultural field, Godard is at least as well known for her work as a translator of Québec women writers and her foundational writing-as-discourse with First Nations writers. The second and third essays of the collection, “Critical Discourse in/on Québec” (1990) and “ The Politics of Representation: Some Native Canadian Women Writers” (1990) work within conversant fields of representation. “Critical Discourse in/on Québec” observes that in Canada, where the “institutional limits are multiplied and fractured” by language and national borders, there is a burden of choice: the critic must ask herself “which narrative to choose…The narrative of intelligibility emanating form the École des hautes étude pratiques in Paris…Or…the new discursive practice in the form of discontinuous, delegitimating narratives which challenge the master narratives and legitimate post-structural knowledge” (84). Rather than bluntly articulating her path, Godard instead sketches another trajectory of the development of literary criticism in Canada. This time, unlike the more generalized assessment of “Structuralism/Post-Structuralism,” her overview is geographically and linguistically bounded. Citing Robert Giroux, Godard notes an inversion or reversal in critical trends that is at first glance retrograde: the “structuralist enterprise, focusing on the function of codes in the production of meaning and on cultural conventions, has given way in the 1980s under discursive subversion and deconstructive virtuosity to a focus on subjectivity” (85). French-Canadian literature, when set in the sights of critics such as Jean Éthier-Blais, is important for its mimetic powers: it “leads us to recognition of ourselves,” and “describe[s] us as we are” (Éthier-Blais Signets 2: 20, 5). The growing interest in sociological origins of literature (Godard 86) and a focus again on la modernité are “additional evidence of an eternal return” in Québec criticism (86). However, these eternal returns are, perhaps, better understood as spirals for, Godard asserts, in fact “contemporary Québec Criticism is indeed poststructuralist” (88). By analyzing the hegemonic nature of discourse (Williams) Godard demonstrates that in Québec the feminist analysis, which emerged in the 1970s with the creation of Les Têtes de pinoche by poets Nicole Brossard, France Théoret, and others (98), has altered the way literary criticism works. “The emergence of women’s writing,” writes Godard, “has accomplished the proliferation of alternative structures—in publishing, diffusing, and teaching” (98). Having mapped a seemingly familiar terrain, Godard shifts the focus to lead the reader through a nuanced lesson both in Québec feminist writing and in post-structural textual analysis. She effects a similar parallax view in “”The Politics of Representation: Some Native Canadian Women Writers.” Beginning with a survey of the unprecedented public attention for First Nations culture in the spring of 1989, Godard manages both a cultural survey and a consideration of why this public attention hadn’t happened before. The spring’s events included the debut of Tomson Highway’s (Cree) now canonical Dry Lips Oughta Go to Kapuskasing, work by actor Gary Farmer (Mowhawk), Ojibwa writer Rebecca Bellmore’s “Ihkwe-wak ka-ayamiwhat: Means Women Who are Speaking” and “Contemporary Art by Women of Native Ancestry,” “Weesageechak Begins to Dance” festival celebrating First Nations plays and playwrights, and culminated with “intensive workshops in Native cultural production organized by the Committee to Reestablish the Trickster” (110). The opening pages of the essay work both as a primer in First Nations cultural production of the moment (spring 1989), and as a subtle message that First Nations cultural production is very active. The workshops, Godard explains, both “herald the emergence of Native culture as a forceful presence in the literary institution,” and by “inscribing this cultural activity under the sign of The Trickster” it also “indexes the ambiguities of this interruption” (110). The workshops, which included “Storytelling for the Stage,” “Re-establishing the Voice: Oral and Written Literature into Performance,” and “The Missing Voice in Canadian Literature” signaled a challenge to institutional Canadian literature. Figuring the workshop under the sign of The Trickster, says Godard, “posits the word as a process of knowing, provisional and partial, rather than as revealed knowledge itself" (110). Further, the challenge posed by First Nations cultural producers “aims to produce texts in performance that would create truth as interpretation rather than those in the Western mimetic tradition that reveal truth as pre-established knowledge” (110). Drawing on Foucault’s analysis of how knowledge and power work together to allow or foreclose speech, Godard then embarks on a close reading of the work of Lee Maracle and Jeannette Armstrong in order to unpack the thorny question of who may speak for whom. What is of particular interest for Godard’s set of questions is the ways in which she reads Maracle and Armstrong as “located within new instances challenging the hegemony of the dominant literary institution” (123). Maracle and Armstrong write in English, but they “take as their interlocutor the dominant tradition in a polemic which is overtly signaled within the texts” (123). Writing both within and outside, Maracle and Armstrong “self-consciously enter the fray surrounding the ‘silenced’ subject of racism” and in so doing have “begun to write the other, otherwise” (159). “Other,” Godard pointedly reminds the reader, “form the perspective of the dominant discourse within which I write” (159). This final self-conscious and deliberate reminder is yet another level on which all of Godard’s essays work. Never does Godard the critic forget that, though she is a woman working in the institution, she is in a position of relative privilege. Thus her essays, which are indeed large nets widely spread, all treat the field of Canadian literature as both potential and polyvalent, and at risk of essentializing or selling out. The remaining essays, “Deterritorializing Strategies: M. NorbeSe Philip and Caucasianist Ethnographer,” “Writing Between Cultures,” “Notes From the Cultural Field: Canadian Literature from Identity to Commodity,” “A Literature in the Making: Rewriting and the Dynamism of the Cultural Field,” and “Relational Logics: Of Linguistics and Other Transactions in the Americas” all insert themselves at the axes of language and power. Here, at the crossroads, Godard rigorously surveys the cultural field. Though her focal point is always Canada, her scope is certainly the world. 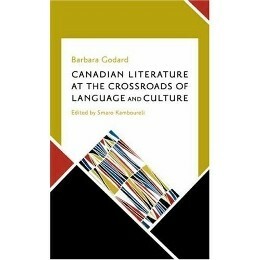 Three days after I accepted the opportunity to review Canadian Literature at the Crossroads of Language and Culture, Barbara Godard passed away. The work of reading as an attentiveness to another and as work of mourning became all the more palpable to me. When a reader picks up this collection, what she encounters is an intrepid critic whose insights and analyses remain among the most important in Canada. What she encounters is a charge to keep working under the sign of the future indicative. Fuller notes a similar paradoxical reaction to the lack of introduction, which, while not wanting to echo, I share and want to express to readers here. See Fuller, especially 247-48, for her specific reasonings. * The title of my review comes from a quotation in “The Critic, Institutional Culture, and Canadian Literature” (47), where Godard quotes her York University colleague Fuyuki Kurosawa (“The State of Intellectual Play: A Generational Manifesto for Neoliberal Times” 11). Éthier-Blais, Jean. Signets. 3 vols. Montréal: Cercle du Livre de France, 1965-1973. Fogel, Stan. “Why Michel Foucault does not like Canadian Literature” Conference on Post-Structuralism in Canada. University of Ottawa, May 1984. Fuller, Danielle. “Reader at Work: An Appreciation of Barbara Godard.” Rev. Essay. British J of Canadian Studies 22.2 (2009): 235-49. Godard, Barbara. "Feminist Periodicals and the Production of Cultural Value." Women's Studies International Forum (March-April 2002): 209-23. Gramsci, Antonio. “Notes on Language.” Trans. Stephen Mansfield. Telos 59 (1984): 127-50. Kurosawa, Fuyuki. “The State of Intellectual Play: A Generational Manifesto for Neoliberal Times” Topia 18 (2007): 11-42. Erin Wunker is an Assistant Professor in the Department of English at Dalhousie University. Her research and teaching are in the fields of Canadian literature and critical theory. She has published articles on feminist theory and contemporary Canadian women’s poetics, and she is currently working on two collaborative projects. One project is a socio-historical survey of public dialogues about poetry in Canada. The second project is engaged in poethics and explores the relation between the poet and the critic.